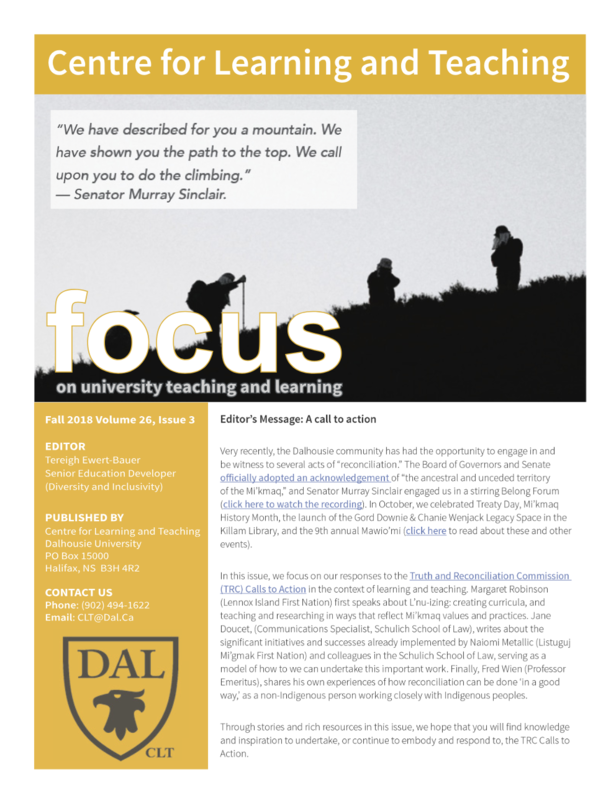 This article first appeared in the Fall 2018 edition of FOCUS, the newsletter of the Dalhousie Centre for Learning and Teaching. The full issue — including additional articles on reconciliation and education from Dal faculty including Fred Wein and Margaret Robinson — can be viewed online here. When Naiomi Metallic joined the Schulich School of Law as a full-time faculty member in 2016, she arrived with a mantle and a mandate. A member of the Listuguj Mi’gmaq First Nation, located on the Gaspé Coast of Quebec, and a 2005 alumna of the law school’s Indigenous Blacks & Mi’kmaq (IB&M) Initiative, Prof. Metallic had been awarded Dalhousie’s inaugural Chancellor’s Chair in Aboriginal Law and Policy. Although the Chair is physically seated in the law school, it is intended to be interdisciplinary, which means Prof. Metallic collaborates not only with her Schulich School of Law colleagues, but also across other Dalhousie faculties and beyond. The chair was created through the generous support of the Honourable A. Anne McLellan, who was appointed Chancellor of Dalhousie in May of 2015. It is intended to foster greater teaching and research on Aboriginal law and policy issues at the law school, as well as to promote interdisciplinary partnerships. “I have a great deal of room to do lots of wonderful things, and I’m truly excited and grateful for this opportunity,” says Prof. Metallic. Prof. Metallic’s plans for her five-year Chancellor’s Chair term include implementing the Truth and Reconciliation Commission of Canada’s Call to Action 28, which calls upon Canadian law schools to teach the history and legacy of residential schools, the United Nations Declaration on the Rights of Indigenous Peoples, Treaties and Aboriginal rights, Indigenous law, and Aboriginal–Crown relations. That first fall, Prof. Metallic organized Blanket Exercises for all first-year law students at Studley Gym, which were facilitated by the Mi’kmaw Native Friendship Centre. A Blanket Exercise is an experiential learning activity that teaches Canada’s history of colonialism toward Indigenous peoples. It was, indeed, “just a start,” and one that would lead to other important initiatives. In September of 2017, the Schulich School of Law launched Aboriginal and Indigenous Law in Context (AILC), a new mandatory two-credit course. It was delivered to all 170 first-year students in two intensive components, one at the beginning of the fall term and the other at the beginning of the winter term. AILC 1, subtitled “The Aboriginal Historical and Continuing Context,” was a two-and-a-half-day introduction to Indigenous culture and traditions in Nova Scotia. Students were provided with an initial set of related readings, attended a Blanket Exercise led by Prof. Metallic, and went on field trips to the Art Gallery of Nova Scotia to view Indigenous art, and to historical Indigenous sites such as Partridge Island and a former residential school. Several leaders from the Aboriginal community spoke on panels about the contemporary issues and challenges facing Mi’kmaq peoples. AILC 2, “From Culture to Law,” was delivered in one day and aimed to build on the cultural understandings established in AILC 1 to consider how law applies to, and is applied by, Indigenous peoples. In particular, this part of the course was designed to introduce students to the distinction between Indigenous law and Aboriginal law. Over the summer Prof. Metallic and her faculty colleagues planned AILC for the 2018–19 academic year, making improvements based on the feedback they received from last year’s evaluations and questionnaires. Enhancements included a day at the Mi’kmaw Native Friendship Centre, where students will be introduced to the issues the urban community faces, a lecture by Senator Murray Sinclair, and more dedicated time for AILC 2 in the winter term so students can get the most out of it. The law school’s TRC Committee, which Prof. Metallic has co-chaired since December of 2016, also continues to do work beyond AILC, such as developing a database of teaching materials for professors at Schulich Law who want to incorporate more Indigenous content into their classes and having a dedicated research assistant to help them prepare curriculum in this regard. “This year we are also exploring options for potentially introducing some additional mandatory content in Aboriginal law in upper years,” she says. Aboriginal and Indigenous Law in Context is a first step that the law school has taken to advance reconciliation, but Prof. Metallic has introduced additional classes to the curriculum since her arrival, including the Indigenous Governance course and, this year, a new survey course in Aboriginal law to complement the law school’s existing major paper courses. Prof. Metallic says the good work that has been happening at Schulich has been a team effort and would not have been possible without a supportive Dean and numerous collaborative colleagues, who have recognized that reconciliation has to be an institutional commitment that requires time and resources (it cannot just be an “add on”). Reaching out to the Mi’kmaq community has also been essential.